Our next group buy covers a product that goes beyond the automotive scene, fire prevention! Element Fire Extinguishers are the world’s smallest and longest lasting fire extinguishers on the market! If you're interested in signing up, please email groupbuy@pelicanparts.com with your First / Last Name and Telephone Number. - Shipping to Continental US, Canada, and Mexico only. - Coming in at just over 0.5lbs and producing 50 seconds of discharge; more than 4x longer than a 5lb fire extinguisher, this tiny unit packs quite a punch! - It’s lightweight, compact size makes it ideal not only for your car, but also for your kitchen, garage, RV, boat, airplane, and anything else that can catch on fire! 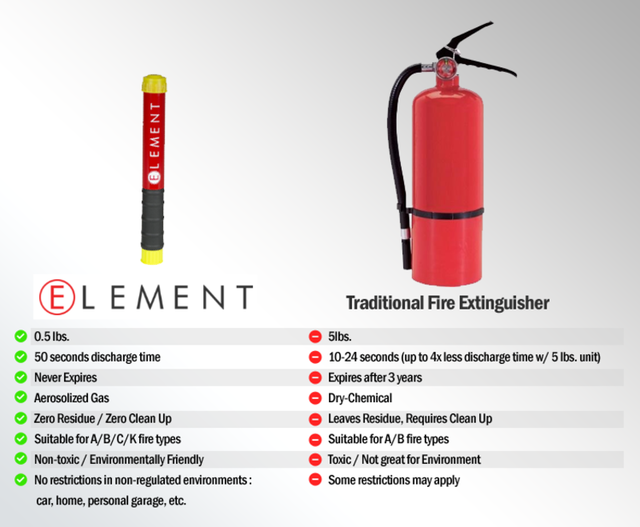 - One of the best features of the Element Fire Extinguisher is that it is completely maintenance-free – you’ll never have to check if it’s still safe to use because it never expires. - Unlike a dry-chemical fire extinguisher that uses solid powder to smother a fire until it's out, the aerosolized gas from Element's extinguishers attaches directly to the surrounding oxygen molecules, robbing fires of their fuel source – meaning that it is clean, leaving zero residue or mess to clean up. So, what are you waiting for? Pick up 2, 3, or as many as you’d like and put them everywhere for that piece of mind knowing they’re close by in case the unthinkable happens. Check out what Jay Leno says about the Element Fire Extinguisher! Last edited by Dmitry at Pelican Parts; 04-10-2019 at 01:21 PM.